The very first thing that drew me to Everless by Sara Holland was the absolutely gorgeous cover for the book. (I can't help it, I just can't resist a book with a pretty cover!) After reading the summary for the book, I knew I wanted to read the book ASAP, and I bumped it up on my TBR as quickly as I possibly could. I'm SO glad I did! This book was awesome, and I'm currently pining away until I get my hands on the second book!! Everless is a fantasy novel, and it's been way too long since I've read a book from this genre. I ended up enjoying the story more than I expected to, and now I want to read more and more fantasy books as soon as possible. The storyline for the book was completely fascinating. Imagine living in a world where time is money, literally. The more blood and money you have, the longer you live, and the more powerful you are. The lifespan for most people isn't very long, because the powerful tax the poor to death, and let's face it; you only have so much blood. It's a vicious world to live in. I really love the main character in the story, Jules. At one time, Jules and her father were servants for rich aristocracy in the kingdom, until an accident forced them to flee in the night. When Jules realizes that father is dying, her only option is to return to Everless to earn more time to save her father's life. But Everless is a dangerous place, and Jules has secrets to hide, and questions that need answers, and she's willing to stop at nothing to get those answers. Jules is awesome; I love her strength and determination. And while I'm a fan of romance in the story, I was pleasantly surprised that there was very little romance in this book, (even though there was potential for some.) I barely noticed this, however, as I was so engrossed in the story and by the fact that this girl literally takes care of herself, and I LOVED that. Girl power! Overall; I really enjoyed Everless so much, and I can't wait to get my hands on the sequel, Evermore, which is set to release in 2019! (Ah, it's such a long wait!) It's been quite a while since I enjoyed a fantasy novel this much, but I did, and now I can't wait to read more fantasy books as soon as possible! 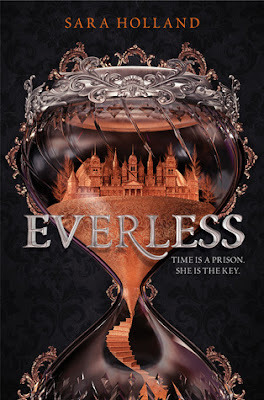 If you're a fan of fantasy, do check Everless, and I hope you enjoy it just as much as I did! Ooh nice! Hearing all good things about this one which is putting my hesitancy aside! This sounds like it might be a good read for me as I do love my fantasy reads! Nice review! !